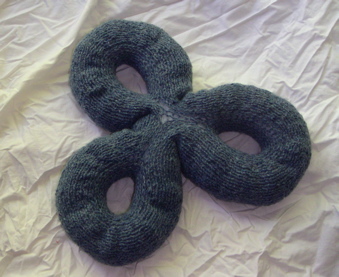 This page is devoted to knitted orientable surfaces, such as the torus, 2-holed torus, etc. I also have a page on nonorientable surfaces and pages on Möbius bands, projective planes, and Klein bottles. While the surfaces on this page actually used more than one piece of yarn, each could have been knitted from a single strand. 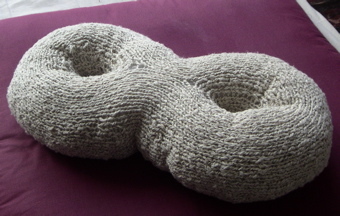 Well, okay, the ball of yarn would have had to be topological---I might have needed to shrink it in order to shove it through some stitches every now and then---but mathematically speaking, each could have been knitted from a single strand. 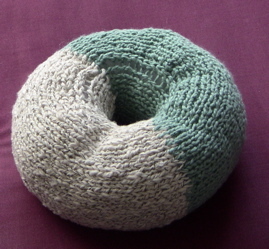 And, here's my first-ever 3-holed torus. I know, the execution isn't pretty. It'll be better next time. 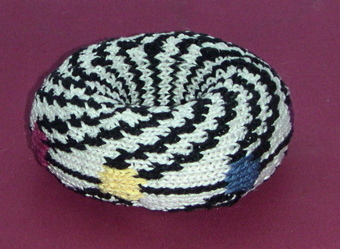 The next photo shows an embedding of K7 on the torus, created for a conference honoring Martin Gardner. K7 is the complete graph on seven vertices, in which each pair of the seven vertices is joined by an edge. K7 is the largest complete graph that can be drawn on the torus without edges crossing. This particular torus seems all edge, no face (like all hat, no cattle) to me so I've made a larger one that looks less edge-y, so to speak. larger K7 on a torus. K7 on a torus, all edge and no face. A paper describing general methods for knitting these surfaces appears in the Journal of Mathematics and the Arts. (Citation: Every Topological Surface Can Be Knit: A Proof, Journal of Mathematics and the Arts, 3(2) June 2009, 67–83.) Knitting patterns will eventually appear...somewhere, probably in a book.